UIC senior center blocked five shots Thursday night against Youngstown State to become the Horizon League’s all-time record holder with 310 in his career. 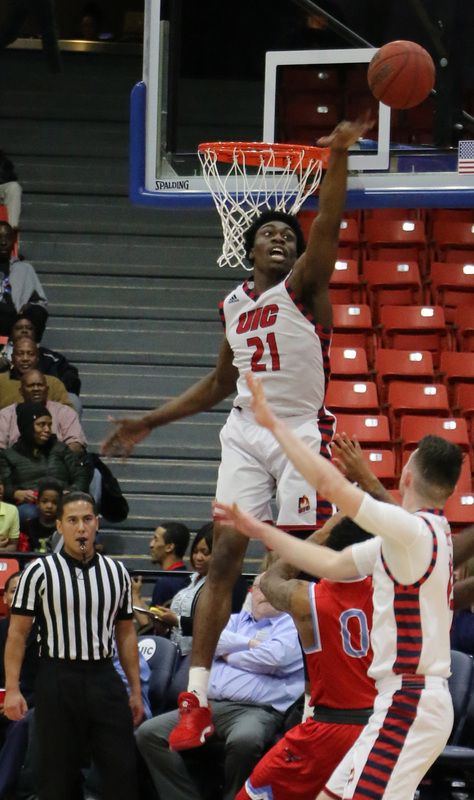 UIC superstar Dikembe Dixson basically was a nonfactor Thursday night, but he had plenty of teammates pick up the slack. Sophomore guard Marcus Ottey continued his ascent with a career-high 29 points and senior center Tai Odiase contributed a season-high 17 points and set the Horizon League career blocked shots record in the Flames’ impressive 92-78 victory at Youngstown State. Odiase rejected five shots and his last block with 13:02 left in the game gave him the record of 310 career blocked shots, breaking the record of the man who used to patrol the paint at YSU’s Beeghly Center, Damian Eargle, who had 309 from 2010-13. However, it was Odiase’s offense and Ottey’s as well that got the Flames going. Odiase was 6-for-10 from the field and 5-for-5 from the free-throw line while Ottey made 12 of 15 shots, including all four of his 3-point attempts. Ottey pushed his team-leading scoring average in Horizon League games to 18.1 points per game. Believe it or not, Dixson had just one point while going 0-for-4 from the field in 26 minutes. He simply deferred to his teammates, who combined for one of the Flames’ best efforts all season. The Flames improved to 4-1 since Tarkus Ferguson returned from a stress fracture in his right foot after the point guard recorded 14 points and 10 assists. Sophomore guard Godwin Boahen scored 14 points and hit four 3-pointers while classmate Dominique Matthews added 11 points and three 3s as UIC hit a season-high 14 shots from downtown and shot 50 percent overall for the game. UIC also had its best ball-handling contest of the season, committing a season-low nine turnovers. After the game was tight to start, the Flames started getting confident with a 13-2 run that included eight points by Ottey to open a 42-31 lead with 4:15 left in the first half. UIC settled for a 46-43 at the half after Odiase hit a last-second layup. The Flames threatened to blow the game open, but the Penguins (5-15, 3-4) showed some fight, taking a 63-61 lead on a layup by Braun Hartfield, who finished with a team-leading 25 points. UIC led by just one at 70-69 after Cameron Morse hit a 3-pointer with 8:37 left, but the Flames answered with a 9-2 run with Ottey providing six points on layups. The Flames ended all doubt when Boahen buried a 3-pointer for an 86-75 lead with 1:39 remaining. UIC won its second straight road game, but knows it a third won’t be easy against Cleveland State on Saturday afternoon. FLAMES FLICKERS: After his one-point effort Thursday, Dixson is still averaging 20.5 points at Beeghly Center in Youngstown. In his freshman year, he scored a Flames’ Division I record 40 points in a 92-91 double overtime loss. … UIC beat Youngstown State for the third consecutive time and for the second straight time on the road. … UIC backup center Clint Robinson twisted his ankle after blocking a shot with 13:10 left in the game and did not return. … Sophomore forward Jordan Blount grabbed a team-high eight rebounds while Odiase came up with a team-high three steals. … The 14-point win was the largest margin of victory in a road game under McClain.